Shadow of the Tomb Raider finished out Lara Croft’s origins trilogy in spectacular fashion. If you’ve been waiting for new things to do with Lara, the first DLC drop is coming very soon. Square Enix gave us a quick tour last week through the first of seven planned content launches, called The Forge. You can read all about it right here and now. 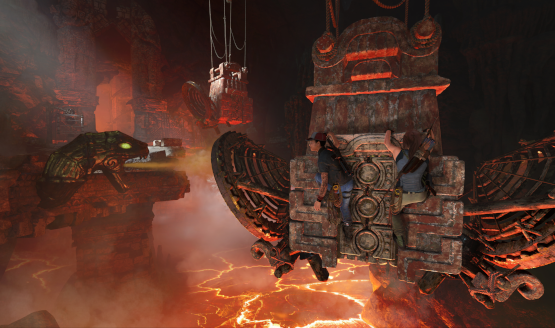 The Forge is centered around a large challenge tomb to explore, either solo or in co-op. During our playthrough, it became obvious that while most puzzles will be doable alone, they will be far more manageable in co-op. This is a good thing for those who prefer to work with others, while also not making things impossible for those who fly solo. For those looking to eke out a bit more value from their downloaded content, The Forge will also include Score Attack and Time Attack modes, presumably with online leaderboards as well. Co-op usually involves players talking to one another, as they work together in an attempt to solve some problem or puzzle. But what if you can’t actually talk to one another, or want to be clear about what the heck you’re talking about? Eidos Montreal thought of that, too, and allows players to tag anything in the map, to assist the other player in seeing what they have to do next. Features like this can really come in handy if you can’t quite describe what it is you want someone to interact with. Now, granted, we were playing through the tomb with a team member from the developer, and breezed through some sections that would have otherwise taken a bit longer to figure out. But the co-op on offer was fun, and rewarding as it always feels good to help out one another while sharing a common goal. Completing the tomb will even unlock a few things to use elsewhere in the game: the Grenadier skill, Brocken outfit, and Umbrage 3-80 weapon are awarded upon completion, whether in solo or co-op. The co-op action in The Forge is a strictly online affair—split screen is not an option here. While this may disappoint some, it also means the fantastic visuals of the game remain intact, and players will be able to use the whole screen to their advantage and figure out what they need to do next. There is no slowdown no matter where each player is on the map. Shadow of the Tomb Raider is probably going to see a lot of play time over the holidays if the content of its DLC remains strong. As far as first impressions go, The Forge is making a good one. The Forge is included for no additional charge for season pass holders ($29.99), or for $4.99 for a standalone download. Get ready for its release on November 13, 2018.